It is world nutella day! In honor of the creamy delicious chocolate…we will be baking nutella cookie sandwich. Here is the list of what you need below. With a spatula combine sugar, Nutella, egg, and flour. Place the dough between two piece of parchment paper (cut the paper the size of your baking sheet). Roll out the dough over the paper to about 1/4” thick. Remove and discard the top piece of parchment paper and place the rest on a baking sheet. 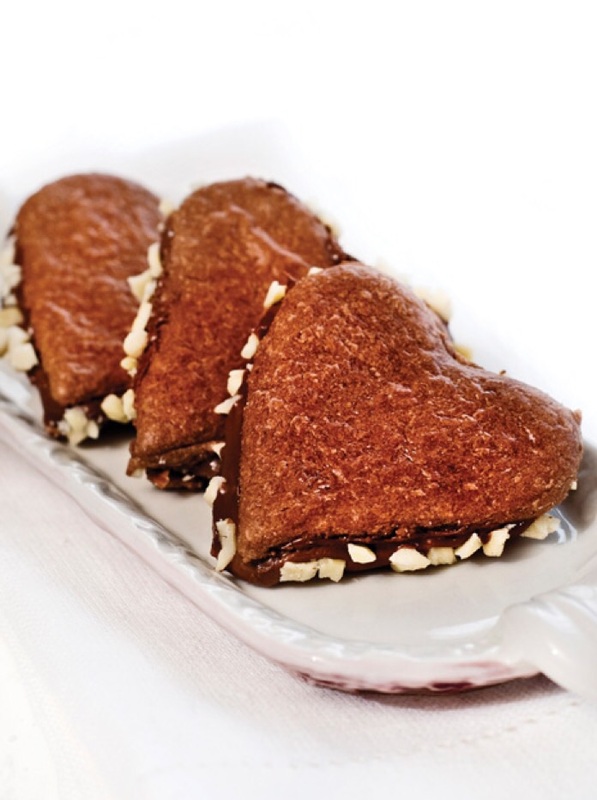 With a heart-shaped cookie cutter press into the dough leaving about 1 cm between each cookie. Remove the excess dough between the cookies. Bake until the edges look done and the middle is just starting to look finished (about 5-8min). Allow to cool on cookie sheet. Spread Nutella on the inside of a cookie and top with another cookie. Press the edges of the cookie sandwich in the chopped hazelnut. Via panoramitalia. Et voila! Happy World Nutella Day Beautifuls.